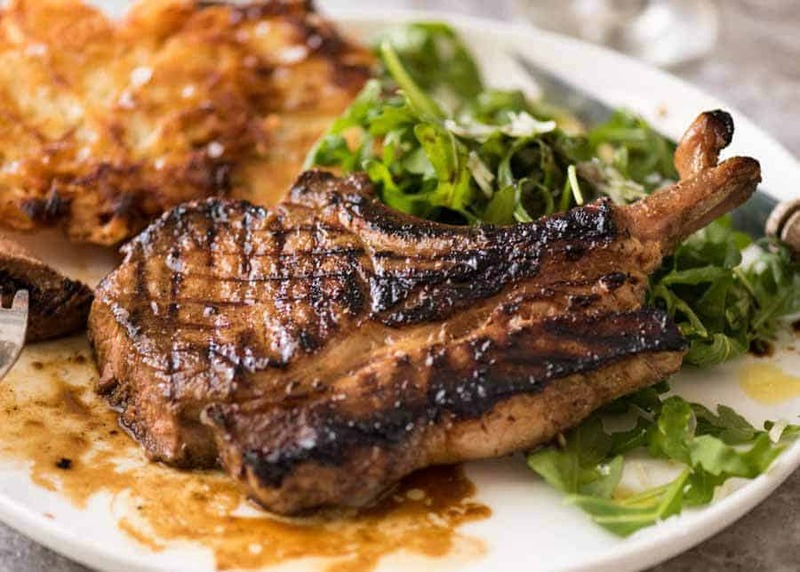 A great pork chop marinade that will make your pork extra juicy with a terrific savoury flavour and a gorgeous caramelised crust without overpowering the natural flavour of pork. Even 1 hour of marinating makes a remarkable difference! You know when something hits the pan and it smells so great than even if it’s the first time you’ve made that recipe, you know it’s going to be a winner? This is one of those. Worcestershire Sauce (I never spell that right first go! Thank you auto correct). “Soy sauce?”, I hear some of you think, dubiously. YES. Soy sauce. NO it doesn’t make this the least bit Asiany (no matter how I spell it, auto correct does not like that word). It’s a brine that injects the pork with juiciness and it’s better than the basic salt + water brine because it’s got more flavour to it. If you’ve never tried a soy sauce based brine for a protein before, I think you’re going to be very pleasantly surprised. 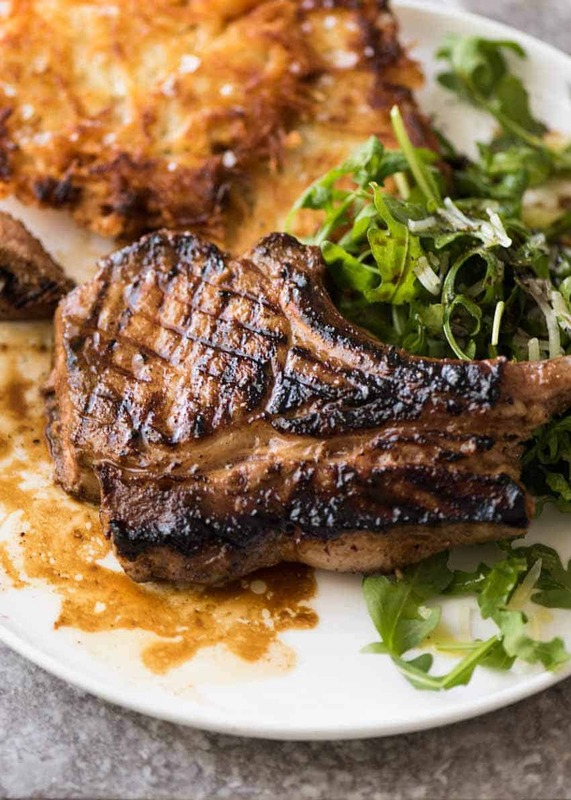 Watch the video below the recipe – the end when I press down on the pork chop to show how juicy it is. That’s courtesy of the soy sauce! I’m sharing this Pork Chop Marinade because I got all excited that I finally got a new BBQ. Living by the ocean means that anything that resides outdoors has a limited life and my current BBQ looks like an abandoned burnt out car. While it’s terrific seared on the grill, it is of course great pan fried as well which is how I usually make it. Recipe video above. 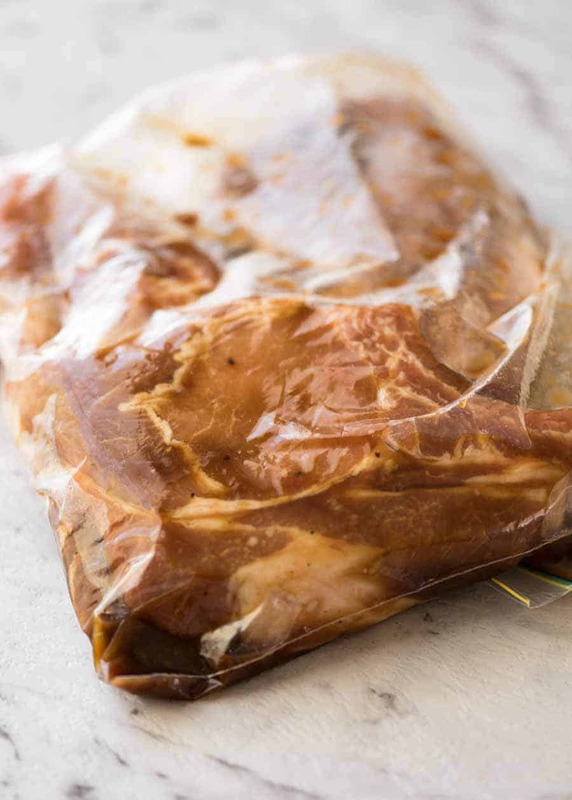 This marinade will make any pork chops or steak extra juicy as well as infusing it with great savoury flavour and a touch of sweet. Soy sauce is the secret ingredient – it does not taste the least bit “Asiany” or soy saucey. MINIMUM MARINADE TIME: 1 hr+ for thin chops, 3 hrs+ for thick. 1. Chops: I used thick, bone in pork chops that were just under 2.5cm / 1″ thick. On the bone, slightly trimmed but not much, I like keeping some fat on the edges to keep the pork really juicy! This recipe will work with any quick cook cut of pork – chops, steaks, even tenderloin. If your chops are thicker than the Thick Chops, then I’d recommend starting on the stove and finishing in the oven at 180C/350F until the internal temperature is 145F / 63C. 3. Troubleshooting / tips: Once you put the chops on the BBQ, DON’T TOUCH IT! Once it is cooked, it will release naturally from the grills. If it sticks, it’s not ready to turn. If your chops are cooking too quickly and start to burn because of the sugar in the marinade, turn the heat down. 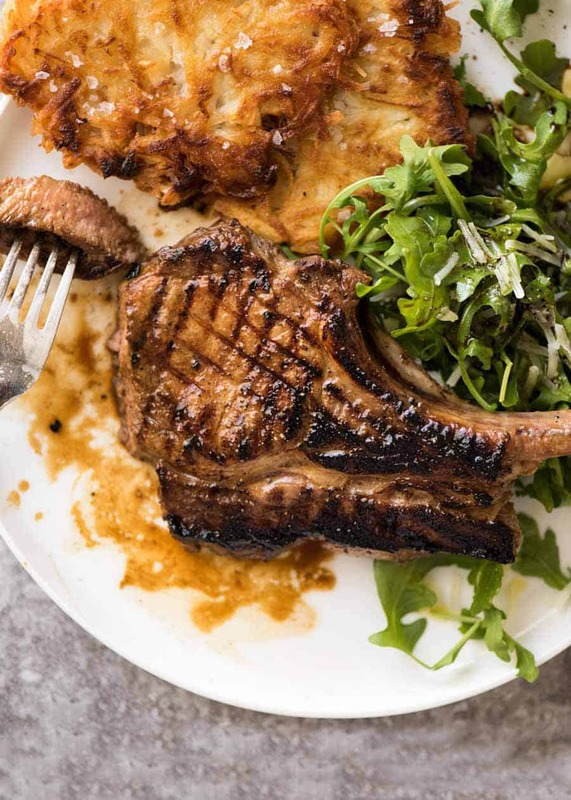 Remember, these chops are meant to have a gorgeous chargrilled crust! 4. CRISPY POTATO ROSTI recipe (pictured on the side of the chops) – by reader request, here’s an abbreviated form of the recipe: 2 large brushed (Sebago) potatoes (US: use russet), peeled and grated using a box grater. Grab handfuls and squeeze out excess liquid or do this using a dish towel (clean!). Place in bowl, sprinkle generously with salt and pepper. Melt 1 tbsp butter + 1 1/2 tbsp oil (I use olive) in a large skillet over medium high heat. Add dollops of potato, spread into pancake shape about 12 cm / 4.5″ wide, 0.75 cm / 1/4″ thick. Press down to compact into rosti, cook for 3 minutes or until deep golden brown. Flip and repeat. Drain on paper towels, repeat with remaining potato, should make 8. Originally posted August 2017, photos replaced in May 2018, some tidying up done in February 2019, no change to recipe. 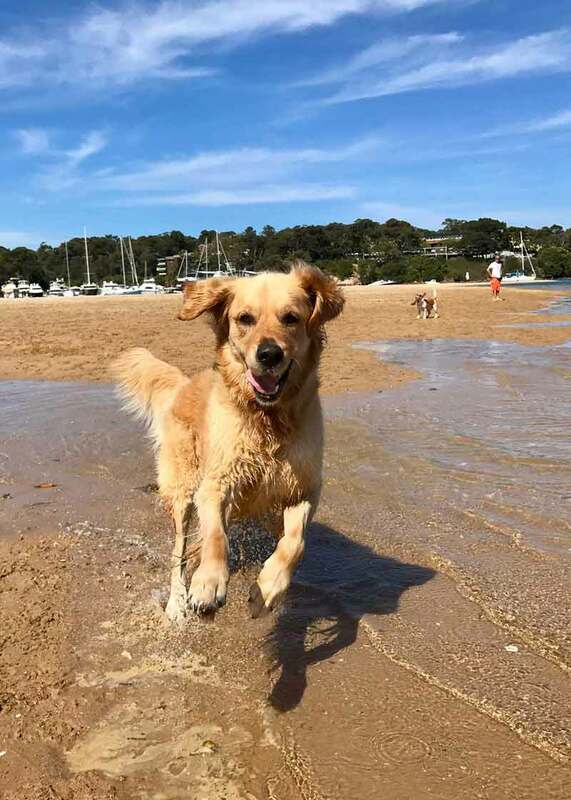 This is what a doggie smile looks like! 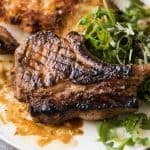 The post A Great Pork Chop Marinade appeared first on RecipeTin Eats.